Food Grade Diatomaceous Earth, also called Fossilized Shell Flour is a powder made from the fossilized shells of algae that lived millions of years ago. It is used by farmers in grain to protect it from insects. It is also used by millers and bakers in flour as it allows flour to flow better. 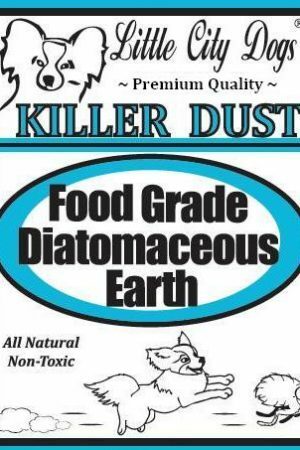 So it is quite likely that you have EATEN Diatomaceous Earth already without knowing it! 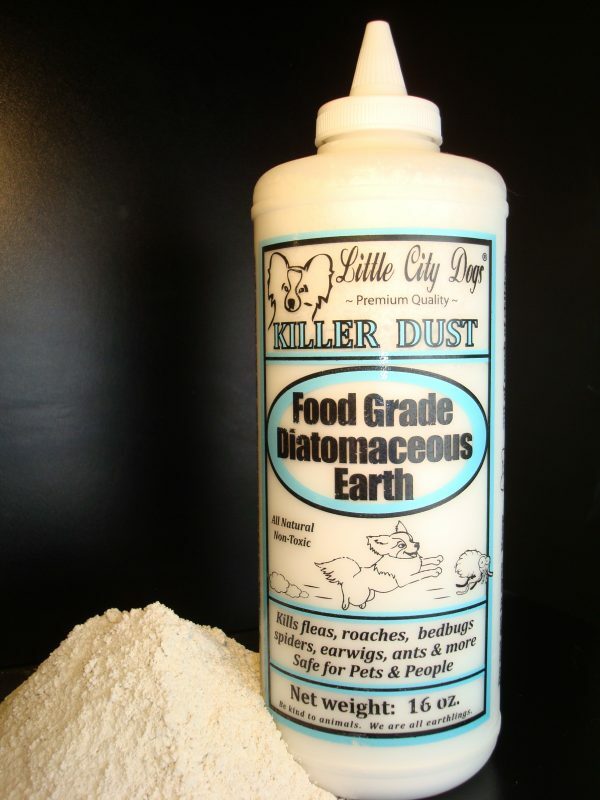 Food Grade Diatomaceous causes bugs to dry and die. Squeeze our twist top applicator bottle to coat a light dusting of our powder where your bugs can walk on it. The powder will cling to their bodies and in short order cause them to dry and die. Is it safe around my pets and family? Yes. In fact it is so safe that many tout its health benefits and regularly drink a teaspoon of FOOD GRADE DE stirred into their favorite beverage as a mineral supplement. Some farmers leave a bin of Food Grade Diatomaceous Earth for their cattle to eat freely as it makes their manure breed fewer barn flies and we allow the Little City Dogs to eat it if they are so inclined. 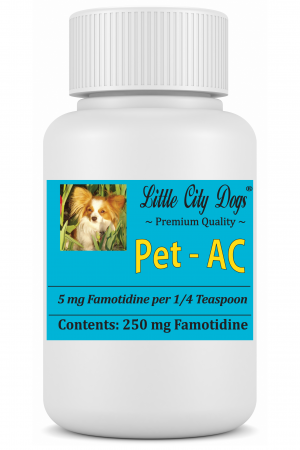 Animals have an instinct to seek out mineral supplements. So, when our Papillons are around DE, to keep them from licking it off the floor we give them a bowlful so they have a clean source of Food Grade DE. While it is safe around pets, people and food, you are cautioned to keep it out of your eyes and do not inhale it. Persons with asthma are cautioned to keep the air around them free of particulates: common ones such as household dust, flour and baby powder, but also roach dirt, dust mites and yes… Diatomaceous Earth. If you have asthma, consider having someone else apply the DE deep into crevices and behind cabinets for you then stay out of the room until all airborne DE has settled. 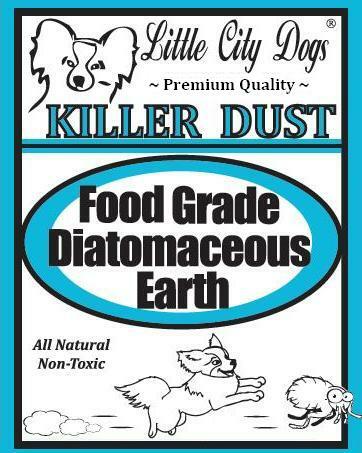 How do you use Little City Dogs KILLER DUST? Squeeze our easy to use applicator bottle to apply a light dusting of our KILLER DUST to use it in your pet’s sleeping quarters for fleas. Dust it behind cabinets, stove and refrigerator to combat roaches and crawling bugs in your home. Hide the dust in cracks and crevices all around your bedroom and your sofa to combat bedbugs. LCD has had personal experience ending two bug problems with our KILLER DUST. We had great results using it against roaches in our kennel, then we used it to rid the bosses home of bedbugs after her kids informed us that their NYC high school had discovered bedbugs there. We gave some to our bank manager who tells us it got rid of her ant problem and we ended a MITES problem that had our neighbor was ITCHING. It turns out it was caused by NYC pigeons that were roosting on her window sill. 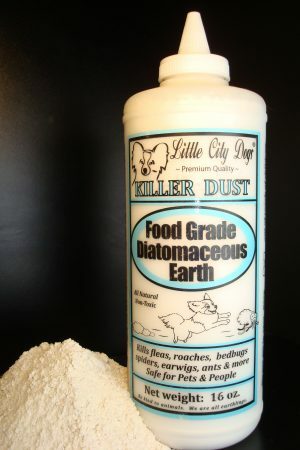 Diatomaceous Earth kills fleas, ticks, roaches, bedbugs, spiders, ants, earwigs, centipedes, silverfish, lice, mites, flies, aphids, beetles, snails, slugs, scorpions and MORE. Bug spray has to be reapplied. You do not have to reapply KILLER DUST unless you sweep it up, vacuum it away or wash it off. KILLER DUST is already 1 million years old. So what’s even 50 years to KILLER DUST? If you dust it behind your cabinets, it will be there killing bugs until you remove the cabinets and wash or demolish the wall. So, it may well be there killing bugs well after your move from your present home! TIP: You can make a bug trap with KILLER DUST because bugs cannot climb a vertical surface covered with KILLER DUST. Our favorite trick is this: Dust the inside of a coffee can or Pringles can lightly with DE. Use no more than what can cling to the walls. Put in something to bait your bugs, leave it where they can find it and forget all about it. In a couple of weeks look inside. Bugs crawl in, but can’t get out. They stay inside and dry up. If you saved the container lid on the bottom of the can, you can close the container with the lid and toss it out. What could be easier. Between dusting your insects where they walk and trapping your insects and tossing them out, in short order your entire bug problem will be HISTORY.